The Angels lost three key contributors to free agency this off-season with the departure of Chone Figgins (Seattle Mariners), Vladimir Guerrero (Texas Rangers), and John Lackey (Boston Red Sox) all leaving via free agency. These three have contributed in major ways to the Angels success in winning the AL West five of the past six years and have to look to new faces to fill these roles, with the same leader Mike Scioscia working his magic as manager. Scioscia, now the longest tenured manager in baseball with ten years under his belt will continue to be the great leader he is. Free agent pitcher Joel Pinerio, is coming to Los Angeles from the St. Louis Cardinals in which he had one of his best seasons in the majors. He tallied 15 wins with a 3.49 earned run average helping St. Louis win the N.L Central. He along with still sort of new comer Scott Kazmir, coming over from Tampa Bay, must produce at a high level to feel the huge void left by Lackey. To replace Figgins at third base the Angels look to Brandon Wood, the kid who has been waiting in Triple-A. He has lots of potential especially in the long ball department as his 16.03 at-bats per homer, with a total of 76 home-runs in Triple-A in three years shows his ability. He will need some time to adjust to big league pitching and will need to do so quickly in order for the Angels to keep their success going in 2010. If Wood does not succeed then Maicer Izturis would fill the hole and be an average third baseman in the big leagues. To replace the speed that Figgins left behind at the top of the order the Angels will rely more on Erick Aybar. Aybar hit a career high .312 last year and should continue to improve. Hideki Matsui, the veteran coming off a huge World Series performance (WS MVP) also signed with the Angels this off-season. He will be taking over Vladimir’s duties as the designated hitter, and is joining former teammate Bobby Abreu. They played together in the Bronx in New York and will be relied on heavily hitting in the middle of the Angels lineup. Hideki should be an improvement over Guerrero because he should not have injury troubles like Vlad has had in the past. The Angels should be able to compete for the top spot in the A.L. West as these new faces are ones that produce at high levels and should continue to. I believe them and the Mariners will be competing for the top spot in the A.L. West. Seattle still has some questionable spots on their roster so the Angels have a great chance at repeating. The Angels also have one of the best farm systems in all of baseball and a great front office so the 2010 season looks good in Anaheim. Here is a look as to what I project the starting line-up to be for the Angels on opening-day, as well as the starting pitching staff. Here is a look as to who I believe would be the best player available at each position from the AL West in 2010 Fantasy Baseball. There are only four teams in this division so there are not as many choices as is the case with the rest of baseballs division’s but there is still plenty of talent. Also included on the list are five close call players or quality backups worth having on your team from out west. C- Mike Napoli/ Los Angeles Angels of Anaheim– Top option at Catcher other than Mauer, Martinez, and McCann. Has hit 20+ homers in each of the past two seasons, which is very hard to come by for a catcher. One of the best hitting catchers in the game, hits in a great line-up and will see time at the DH spot which gives him more at bats. 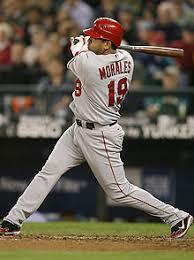 1B- Kendry Morales/ Los Angeles Angels of Anaheim– Time for an encore. He replaced Mark Teixeria and the Angels continued to dominant thanks to strong play from this 1B. Should hit around .300 and have 25+ homers with 80-100 RBIs. SS- Erick Aybar/ Los Angeles Angels of Anahiem- His time to shine. He takes over the spot at the top of the order for the Angels. He had the eighth highest batting average in the AL last season hitting .312. 3B- Chone Figgins/ Seattle Mariners (Most Speed)– Table Setter. He makes the offense go. Has the combination of speed, ability to hit the ball to all fields, and everything else you want from a hitter except power. If Figgins is on your team or a plan for it be sure to draft for power at 1B and in the OF. OF- Ichiro- RF/ Seattle Mariners (Best Player In Division)– Count on 200+ hits from me. Always towards the top of the league in batting average, steals bases, and everything else you will want. OF- Torii Hunter- CF/ Los Angeles Angels of Anaheim– Consistent leader and gold glove winner. Great hitter as well. OF- Josh Hamilton- LF/ Texas Rangers (Most Power)– Let him stay healthy for a season!!! This guy can flat out hit. Everyone remembers him launching balls at the All-Star game in New York and in the first half of the 2008 season. He needs to just stay consistent and try and not do too much. His average is superb, being one of the best hitters in baseball as long as he isn’t hurt. DH- Hideki Matsui/ Los Angeles Angels of Anaheim– Now “Godzilla” of the West. Rumors are that Torii Hunter has given him a new nickname but whatever the name this man produces. Proven professional who plays with great respect for the game. 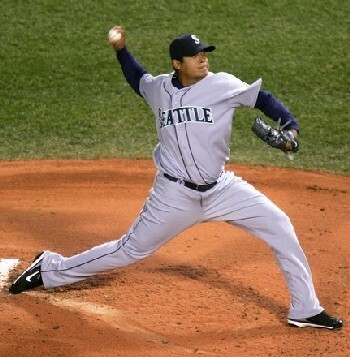 SP- Felix Hernandex/ Seattle Mariners– Cy Young Winner? If not should finish in the top 5. SP- Cliff Lee/ Seattle Mariners– Revenge on the Phillies! CL- Andrew Bailey/ Oakland Athletics– No longer a rookie and was the best one the AL had to offer last year, winning the Rookie of the Year Award. Only downfall is how many save opportunities will he get in Oakland? OF- Nelson Cruz/ Texas Rangers– Had a power surge last year. I don’t expect him to hit as many homers as he did last year (33) but even 20-25 is quite a few and worth having as a fourth outfielder or a backup on your team. DH/ OF- Jake Fox/ Oakland Athletics- Coming over from the Chicago Cubs he looks to fit in with the other youngsters playing in Oakland’s everyday line-up. Tons of power and size, worth drafting in the late rounds because of the potential. SP- Scott Kazmir- Los Angeles Angels of Anaheim (Sleeper Pick)- Biggest risk, biggest reward pick. He could be the highly touted pitching prospect he was thought to be all along coming out of the Mets farm system or could be the overhyped player. Big question mark, but when the stuff is there it is top notch. 3B- Mike Young- Texas Rangers- Quietly does his thing. Young continuously hits for one of the best averages in the American League last year hitting .322, fifth best in the AL (tie-for 9th in all of baseball with Joey Votto of Cincinnati). I keep hearing that the Angels are taking a step back in 2010 as if Chone Figgins was the one guy that made that team go. Vlad and Lackey are key losses, but they have missed enough time over the past few years that the Angels already know how to win without them. I see the loss of OF Gary Matthews, Jr., as the the biggest loss – who will distribute the HGH in the clubhouse? Seriously though, they have a stud rookie in Brandon Wood with the roster flexibility to hit him 9th with no pressure to perform (and with no one breathing down his back to take his job). Who wouldn’t love to be in that position? I expect he will respond well. Their pitching staff doesn’t have the big-time standout names like the Yanks or Sox, but they are the best one through five and very deep in the bullpen. Some say the Mariners and Rangers improved enough to compete with the Angels, but not me. The Angels will continue their dominance again in 2010.